Being burglarized can be a traumatic and expensive experience, regardless of whether you are present for it or not. It can happen to anyone, anywhere, but there are certain measures that we can to take to protect ourselves from theft. This is doubly important when we are talking about a self-storage unit, because you are not there to ensure the safety of your possessions. Most self-storage providers have measures in place to ensure the threat of theft is minimized, but there are still steps you can take to protect yourself and your belongings. 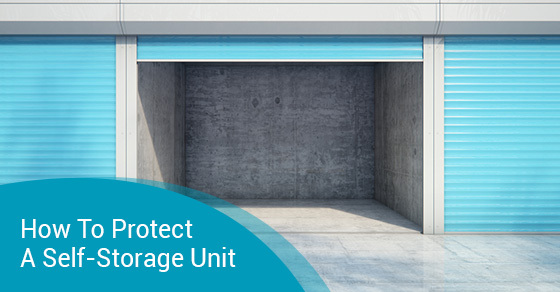 Below are some of the ways to help secure your self storage unit. This goes without saying, but it is surprising how often people forget to do their homework when choosing a self-storage provider. A quick search on Google and a perusal of the comments left by people who have used a particular company’s services should give you a good idea of how much that business values your property’s security. Anything of high value or containing sensitive information should be placed in the most difficult to reach area of your unit. Thieves will want to get in and out as quickly as possible, without being seen by the facility’s surveillance system; making it hard to get to the valuable items in your unit is a good way to ensure they’re not taken should an incident occur. Many self-storage providers will let you select your own lock for your unit. Make sure to spend a little extra on a lock that will stand up to bolt cutters. This means avoiding locks with long shackles. The shorter the shackle, the harder it is to get a good enough angle on the lock to cut through it. Individual door alarms are a great deterrent because if you enter in the incorrect code, an alarm will sound that will hopefully drive would-be thieves away. They are not overly expensive and are a good investment if the contents of your storage unit are worth a lot of money or have sentimental value. Choosing a reputable and responsible storage facility should be the number one priority on your list when placing your belongings in self-storage. There are some mitigating procedures that you can undertake yourself to ensure that you and your family’s belongings remain safe and sound while in storage. Keep the above tips in mind and rest assured that you have made your property as difficult to steal as possible.